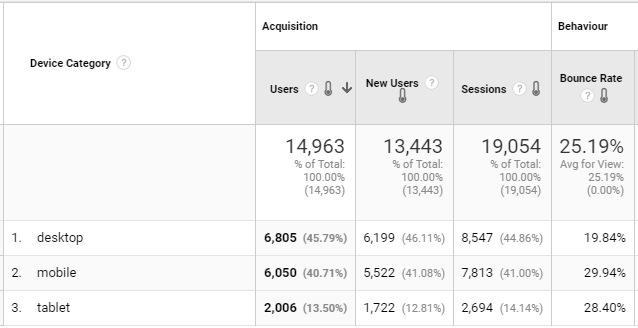 Want to know exactly which version of your site users are seeing? Hint: You won't find the right answer in GA's 'Mobile Overview' report. Mobile devices have become increasingly popular, to the point Google now analyses the mobile version of a site for its SEO algorithms. Responsive design is now critical to any website. The categories above are great, but within each are dozens or possibly hundreds of individual devices. Their screen widths can vary massively. In a single category there could be several different responsive layouts. Each will perform differently. For responsive design to work, CSS media queries are used to amend the layout depending on the browser width. The point at which a layout must change is called a breakpoint. Your site will use something similar. If you don't know yours, you can ask your web developer for them. If you want to know more about which breakpoints to use, here's a handy guide. With breakpoints, the design is based upon the screen width. In the example above there are 5 different breakpoints. In GA there are only 3 device categories. This means many breakpoint layouts will be seen on a single device type. Before I show you how to do this yourself, here it is in action. Below we can see 5 different breakpoints - just for mobile. The bounce rate varies from 19.99% up to 45.45%. That's a significantly wide range. At the device category level we would only see 29.29% and be none the wiser about what's really going on. More importantly, your ecommerce and goal conversion rates will be affected in the same way. Now you know the importance of analysing breakpoints rather than device types, let's get you all set up in GA. The following tutorial uses Google Tag Manager (GTM). Your web developer could help if you're using the standard GA script. Before getting started, ask your web developer for all of the breakpoints used on your site. It's unlikely that a user's screen with change during their session but you never know, so keep 'Scope' as 'Hit'. EDIT: Set the scope to 'Session' so metrics like bounce rate, avg session duration etc. are associated to the custom dimension. You should now see your new custom dimension in the list. Make a note of the number in the 'Index' column. If you're not using a 'Google Analytics Settings' variable, I highly recommend you do, it will save you a lot of time. Find out more in Simo Ahava's guide. If you're not sure the width of your current browser window, don't worry, I've created this tool to help with that. The data has started flooding in, now to start using it. You'll be able to see the breakpoints as a secondary dimension in all the standard GA reports. You can also create a custom report and use it as a primary dimension. If you've got any questions you'll find me on twitter @StuBowker.